Bats are an asset on any farm. These fleeting figures of the night are extremely effective and cost-free insect killers, and are of inestimable value to crop farmers. 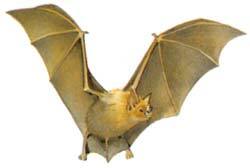 The bat colonies in the De Hoop Nature Reserve provide such a service to the farmers in the Bredasdorp area. Approximately 300 000 of these strange little mammals consume about 500 kg of insects per night, and eventually about 100 tonnes of insects per year. Insectivorous bats make use of ultrasound for both communication and hunting. They can navigate in pitch dark by emitting clicking sounds - about 250 per second - which are reflected by any object in the way. The returning echo enables the position of the object to be determined. The calls of bats are mostly of too high a pitch to be detected by the human ear. Bats can vary the length of their calls, and may emit cycles of less than a thousandth of a second when approaching their prey. The approximately 75 species of bats which occur south of the Kunene and Zambezi rivers represent an incredible quarter of all species of terrestrial mammals in this area. One of the chief predators of bats is the bat hawk. Human disturbance and the injudicious use of poisons present the greatest threats to the survival of bats, however, and could mean the extermination of these useful natural insect killers. Bats should therefore be regarded as the farmer's friend and given the protection they deserve. HOW CAN YOU HELP BATS SURVIVE? Avoid disturbing bats unnecessarily, especially during the breeding season. If bats are a problem in roofs, try to block all holes with chicken wire. PROTECT THE BATS ON YOUR PROPERTY IT IS TO YOUR OWN ADVANTAGE!